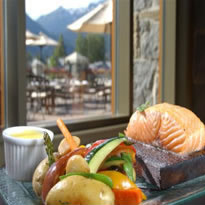 After a hard day on the slopes or the summer hiking trails, settle in for a myriad of Whistler dining options. All corners of the culinary world are represented here, from the best in Italian, Indian, Japanese, Korean, French, German, Greek, or good old fashioned American fare, Whistler has it! Suggested restaurants such as the Bearfoot Bistro, Araxi, Rim Rock Café, and La Rua are always receiving international recognition. But do not worry if you cannot get a reservation, there are plenty of other options right at your doorstep, the Aubergine Grill in the Westin is top notch, followed by Sachi Sushi, Sushi Village, and Celadon for the best in Japanese and Korean dishes. For Italian, we suggest Quattro’s in the Pinnacle, and the Trattoria de Umberto in the Mountainside Lodge. Do not forget to try The Tandori Grill for very good Indian food, as well as Bavaria Restaurant for some great German fondues. Again, there are so many more choices, you could easily eat for a month in Whistler and never hit the same place twice! For a good steak, head to Hy’s Steakhouse or the Keg Restaurant. The former is somewhat more expensive than the latter, but both are equally as good. For the budget conscious, they are some real high quality places to check out. For pasta, check out Pasta Lupino near the marketplace, it is good, fresh, and homemade, or head to the family favorite Old Spaghetti Factory. For wood-fired pizza, head to Caramba’s Restaurant, it is fantastic and do not forget to order the calamari. For breakfasts, make sure to go to the Wildwood Café in the tennis club, as well as Crepe Montagne. Also, no trip to Whistler would be complete without a trip to Creekside for eggs Benedict at the Southside Diner. 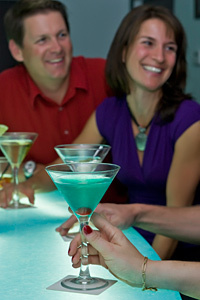 There are also some Chain restaurants such as Earls’ and Rick’s Grill that are quite good and have great atmosphere. You name it Whistler has it, so bring your appetite!